Look: Golden w/a slim cloudiness. Taste: Hmmmm, it's good, flavorful and easy on the taste buds. Some bitter in it, too. Feel: Middle of the road. Overall: Pretty gosh-darn enjoyable when one desires and deserves, a nice pilsner flavor. Straw, clear. Medium-slow rising bubbles. Thin head. Poor head retention. Leave a little lacing behind. Clean lager yeast, sweet pale malts, some honey-like, spicy noble hops. Spicy hops up front, slight floral. Sweet pale malts, cracker, some biscuit. Clean yeast. Finish is very crisp. Light-medium bodied, crisp, clean, soft, refreshing, well carbonated, super drinkable. Aroma is big spicy Saaz hops and bready/grainy malts. The flavor is malts/grains, mild citrus, fruit and a spicy Saaz hop/slightly beery/crisp finish. Pours a clear gold color. 2/3 inch head of a white color. Great retention and good lacing. Smells of pale malt, floral hops, slight citrus hops, hint of caramel malt, and a hint of wheat. Fits the style of a German Pilsner. Mouth feel is smooth and clean, with an average carbonation level. There is a slight bitterness. Tastes of pale malt, floral hops, slight citrus hops, hint of caramel malt, and a hint of wheat. Overall, light bodied, good appearance, with a decent feel and blend. Taste: grainy some herbal bright hops bitter bite. Slightly dank nose. Gold, clear, white head some lace. Medium body. I wonder if it was passed it freshness date? Notes via stream of consciousness: It's got a very nice appearance. The body is only slightly hazy, and I'm inclined to call it clear except that everything I see through the glass is distorted. It could be clearer. On the other hand, if it's unfiltered that could be OK. It's fluffy head of bright white has now dropped but it held pretty well so far, and it's still got a solid surface covering. The aroma displays some clear grainy malt, and a bit of hops, but not as much as I'd expect from a "Bright Bohemian Style Pilsner". It's OK, but not great. On to the flavor... nice. There's more hop flavor there than I expected given the aroma. Maybe this is an old sample, I have no way of knowing. 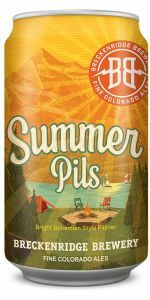 Of course it is a "Summer Pils" and it's only June 5th so it can't really be that old. There's a nice balance of grainy, sweetish malt, and grassy and floral and spicy hops; and a stiff bitterness balances it, leaving a dollop of sweet malt on the front of the tongue but ultimately finishing dry and lightly spicy with a squirt of lemon in the finish. Kudos for that. In the mouth it's medium bodied and gently crisp-then-smooth. Overall it's quite pleasant, and a very good interpretation of the Bohemian Pilsner style. L: Pours a brilliant straw gold with a nice white head and a few rings of lacing. S: Slight bit of corn and grain, some sweet malt, mixed with a light floral hop. T: Some grain, some sweet malt, a slightly bitter floral hop. F: Light crisp and clean. Poured out a clear, golden yellow color with a bubbly large white head of foam. It smelled of caramel sweetness and not much else. Sweet caramel. Little to no hop bitterness.